MJ DeMarco is the current founder of Viperion Publishing Corp., a media company focused on online and print content distribution. He also is admin/founder for The Fastlane Forum, the webs’ leading destination forum for start-up, finance, and entrepreneurial business discussions. 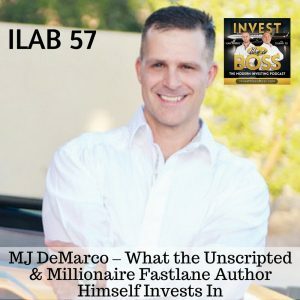 He was the former start-up Founder/CEO of Limos.com, a global ground transportation aggregator and marketplace that he successfully built and grew into a profitable multimillion dollar company, all with no money, no formal training, and with just a few employees. Through rigorous years of self-study, countless errors, and failures, MJ cracked the code to wealth and shockingly discovered that it had nothing to do with jobs, 401(k)s, mutual funds, or penny-pinching your life away for 40 years. During the show, MJ will share his financial roadmap that creates millionaires and gives you control over your financial plan. He’ll reveal his personal investment portfolio and explain how he balances success with happiness. Find out if you should demand the fastlane, take the alternative road-to-wealth, and live rich for a lifetime. Listen to ILAB 57 on iTunes here or subscribe on your favorite podcast app. 10:01 – Is the fast lane for everyone?